ePublishing Knowledge BaseePublishing Knowledge BaseePublishing Knowledge Base Common QuestionsHow do I grant access to ePublishing to access my Google Analytics? Of all of these, the last one is the most important. 1. Log into Google Analytics and go to the Admin tab. Make sure you select the correct website account if you manage multiple websites in your Google Analytics account. 3. 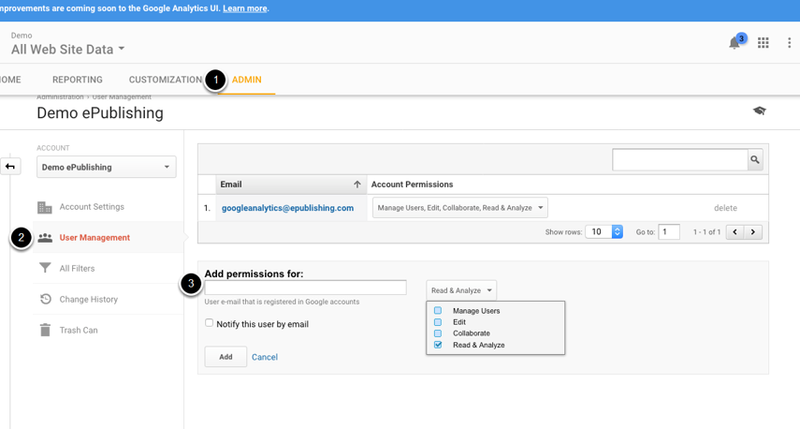 Add permissions for googleanalytics@epublishing.com to access your analytics. Type googleanalytics@epublishing.com under "Add permissions for:" (#3 below). Click Add. Then select Read & Analyze in the dropdown, as shown. Zoom: Add permissions for googleanalytics@epublishing.com to access your analytics. Prev: How can I control the Common Links shown on my dashboard in my Admin tool?